It’s a hot 88 degree day in Cambridge, MA. After walking three-quarters of a mile from the campus of MIT, there are one-and-one-half miles remaining on our trek to the center of Harvard University. 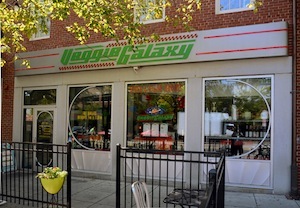 Stopping to “confirm” directions with a waiter decorating his table on the edge of the sidewalk, I glance left to see my wife Shelli vanishing through the door of the Veggie Galaxy Diner & Vegan Bakery. 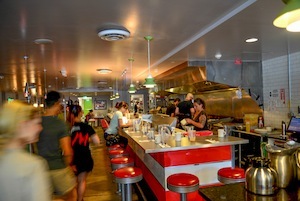 How fortunate for vegan travelers to be able to step out of the broiling sun drilling down from a cloudless sky and slip into this ’50s-style diner. The counter on the right has kitchen and cooks on one side and 15 stools crowding the other. To the left are a handful of booths with four tables straight ahead. The walls are a gallery of tastefully displayed posters, photographs, and drawings of diners from around the United States. The friendly hostess directs us to a table and delivers a well-organized menu featuring more items than there are seats in the restaurant. Breakfast, lunch, and dinner are served with vegetarian and vegan options. Whether they are made with farm fresh or tofu eggs the bulging omelets sizzle out of the kitchen surrounded by golden hash browns. This garden-fresh hearty breakfast will run from $8 to $10 including a beverage.